The RAF made much use of their 4-engined heavy bombers during the WW2, and material was produced to train the 7-man crews. 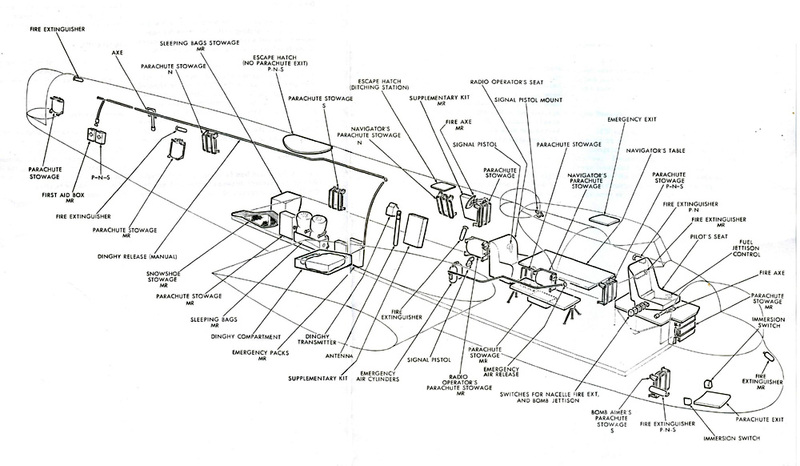 Cutaway drawings were heavily used, as they gave a clear view of the interior of the aircraft, and showed where equipment could be found. The colour codes used for safety equipment showed crews where each piece of emergency equipment was located and which items were to be used together. It was important to show the crew where the fuel valves were in order to extinguish engine fires, but perhaps the 2 most important items of safety equipment were the aircrew’s parachutes and dinghy. The importance of these items is shown here, as the ‘J’ Type Mk III dinghy is described in close-up detail; including an illustration of where the equipment is stored in the dinghy. Knowing the interior layout could mean the difference between life and death during an emergency evacuation of the aircraft. A clear understanding of the obstacles to escape, such as the main spar, would help the crew to react instinctively and correctly in a crisis. The Upper hatches on the Lancaster Fuselage are Ditching/escape hatches and not Parachute exits. On most versions, there’s one between main and trailing spar in the centre section and one just in front of the Mid-upper turret, and the one over the Pilot. Parachute Exit Hatch in floor of nose should be used by all members of Crew if time is available; originally it was released by a handle in the centre, lifted inwards and jettisoned, but when Mod. 1336 is incorporated the hatch is enlarged and is opened by a handle at the Port side. It opens inwards and is secured by a clip which holds the hatch up on the Starboard side. It can also be opened from outside the aircraft. (ii) On Lancaster VII there are 2 push-out panels in the roof, one above the Pilot and one just forward of the rear spar. ORS were so concerned re the Lancaster hatches, that they campaigned for 2 years to change them. By the time they succeeded, the War was virtually over. The Caterpillar Club is an informal association of people who have successfully used a parachute to bail out of a disabled aircraft. After authentication by the parachute maker, applicants receive a membership certificate and a distinctive lapel pin. In 1922 Leslie Irvin agreed to give a gold caterpillar pin to every person whose life was saved by one of his parachutes. At the end of WW2, the number of members with the Irvin pins had grown to over 34,000 though the total of people saved by Irvin parachutes is estimated to be 100,000. Parachutists who landed in the water and were rescued were eligible for the Goldfish Club. Bomber Command Aircrews flew over large expanses of water, and part of their Training was how to evacuate the Aircraft and use the dinghy in the event of the Aircraft having to come down or “ditch” in the sea. As well as there being a correct procedure for actually ditching the Aircraft, once in the sea Aircrews needed to know their dinghy drill. All those, therefore, who are at any time likely to have to use a ‘yellow doughnut’ are advised to study the drills carefully and to find out everything about the dinghy and its equipment. ‘Taking to the boats’ is one of those things you may never have to do – but if you do have to do it, you want to do it pretty quick. Each man had to be aware of his role and “ditching station” in the event of such an emergency. To enable the men to learn their duties quickly, this air diagram clearly shows each crew member as a coloured figure in the correct position, and gives a step by step guide to ditching and leaving the aircraft. Air Ministry Pamphlet 204 and Pilot’s Notes-General (AP2095) gave aircrew further instructions on this topic. Goldfish Club: a label pin and membership card given to personnel who had used a rubber dingy to escape a ditched aircraft. With P B Cow`s financial backing the club was named the Goldfish Club – Gold for the value of life and fish for the sea – and a badge was designed showing a white-winged Goldfish flying above two symbolic blue waves. By the 1940s the Company was one of the world’s largest manufacturers of Air-sea Rescue Equipment. 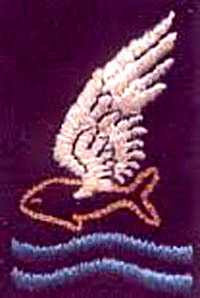 Each member received a heat-sealed membership card and an embroidered badge. By the end of the War, the Club had over 9000 members and it had been intended that further membership should cease. However, membership application forms continued to be submitted to P B Cow and it was obvious that the spirit of the Club was still very much alive. The main aim of the Club was ‘to keep alive the spirit of comradeship arising from the mutual experience of members surviving, “coming down in the drink“. An article in the RAFA journal ‘Airmail’ in January, 1951, renewed interest in the Club, and a Reunion Dinner was held. It was a great success, and the Club was reorganised on a formal basis in March, 1953. Reunions have been held annually ever since at various venues with many distinguished guests. In response to a message of greetings sent to her, Mae West made it clear that she took great pride in the fact that members of the RAF had adopted her name for their life-jackets. I have just seen that RAF flyers have a life-saving jacket they call a “Mae West” because it bulges in all the “right places.” Well, I consider it a swell honour to have such great guys wrapped up in me, – know what I mean? Yes, it’s kind of a nice thought to be flying all over with brave men, even if I’m only there by proxy in the form of a life-saving jacket, or a life-saving jacket in my form. I always thought that the best way to hold a man was in your arms – but I guess when you’re in the air a plane is safer. You’ve got to keep everything under control. Yeah, the jacket idea is all right and I can’t imagine anything better than to bring you boys of the RAF soft and happy landings. But what I’d like to know about that life-saving jacket is – has it got shapely shoulders? If I do get into the dictionary – where they say you want to put me – how will they describe me? As a warm and clinging life-saving garment worn by aviators? Or an aviator’s jacket that supplies the woman’s touch while the boys are flying around nights? How would you describe me boys? I’ve been in Who’s Who and I know what’s what, but it’ll be the first time I ever made the dictionary. The Mae West was a common nickname for the first inflatable life preserver, which was invented in 1928 by Peter Markus (1885–1974) with his subsequent improvements in 1930 and 1931 The nickname originated because someone wearing the inflated life preserver often appeared to be as physically endowed as the actress Mae West. It was popular during WW2 with the RAF servicemen, who were issued inflatable Mae Wests as part of their flight gear. 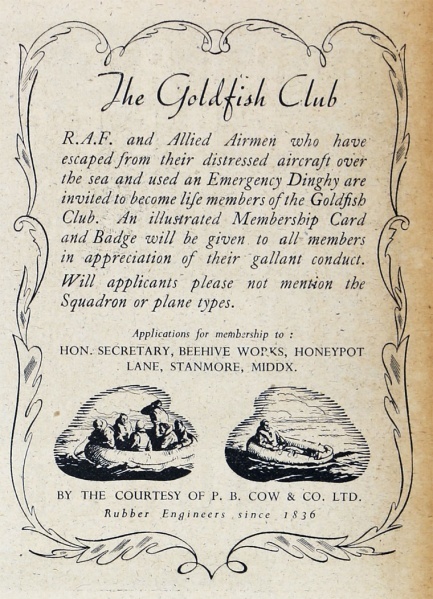 Aircrew members whose lives were saved by the use of the Mae West (and other personal flotation devices) were also eligible for membership in the Goldfish Club. The Mae West was not inflated until after escape through the hatches from the sinking aircraft. Initial temporary buoyancy was provided by Kapok collar and breast panels till fully inflated with air – it was later discovered that kapok lost its buoyancy when saturated with oil. Ditching was one of the worst fears for Bomber Crews, the internal spaces of bombers were cramped and full of protruding equipment, so rapidly exiting a sinking Aircraft was a real struggle. 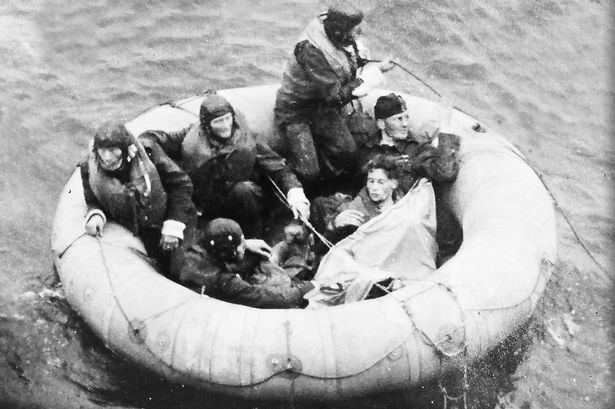 Once you were safely out of the Aircraft, survival was the 1st order of the day in often freezing temperatures at sea. There was faint hope of rescue, reliant on the position report the wireless operator may have managed to send prior to ditching, which may be several hours old by the time rescuers arrived in the area. All bombers had dinghies on board and the Crew were trained how to use them. The Aircraft also carried with them homing pigeons so if a crew ditched or crashed they could release the pigeons with a message of their approximate position. Even with this system, some crews were not found for days and many were never found at all. One account describes how 4 members of a crew were afloat on the English channel for 9 days with only a small tin of Horlicks tablets, a small tin of chocolate and about a pint of water. They were eventually spotted and picked up by an RAF high-speed rescue launch. Sometimes a downed crew had time to send out a mayday radio signal and give their position and notice that they were ditching in the sea. 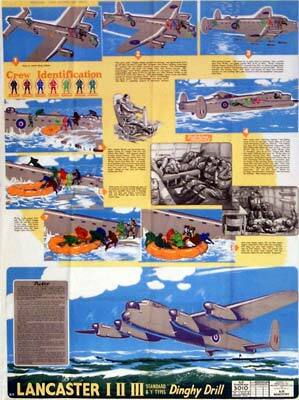 In January 1941, the British Air Ministry had created the Directorate of Air-Sea Rescue. Bomber Command aircraft were equipped with dinghies, dye markers and a lightweight radio transmitter for downed crewmen. Aircraft and high-speed boats were launched to find and retrieve them. Life expectancy in the North Sea at this time of year is 30 minutes due to hypothermia. The K Type dinghy was a single person type and was 1st introduced on New Years Day 1942. There were 2 versions, 1 in rubberised cotton and the other (the KS Type) in rubberised silk, which folded up better than the cotton type. First issues were basic, but a year after a mast and sail were included in the pack, while some models also had a foul weather cover which was attached at each end and rolled towards the middle, the upper end having a hood for the occupant. Later oars, sea anchors etc were included. As for the way they were carried, there were several different types of packs available for the K Type, the C Type pack having clips which attached it to D rings which were found on the hips of the chest type harness, allowing the pack to form a cushion. The Type F pack was carried in a similar way but contained less equipment and was intended specifically for aircraft with restricted space. The importance of this drill can be realised by examining the following case. A Hampden Bomber ditched 60 miles East of Yarmouth at 03.20 hours. All the crew were saved after spending 9 days afloat in their dinghy. This Aircraft was on its way to Dusseldorf. Ten miles out from the Dutch coast, the port motor began to fail. At this time the aircraft was flying at 17,000 feet. The Captain immediately jettisoned his bombs “safe.” He then had a look around the Cockpit and endeavoured to find the cause of the Engine failure. There was no indication of the reason for failure, except that the boost read a drop from -½ to -2 ½ lbs. A few minutes later the Port Engine failed completely amidst showers of white sparks and large blue flames from the exhaust. The Aircraft was now well out to sea and the Pilot considered that he could easily manage since he had already done a return journey on 1 motor. He lost 11,000 feet, however, because he got into a stalled position on 2 occasions. The Wireless Operator transmitted an SOS which was unfortunately not received; probably the aerials were carried away when the guns and ancillary equipment were jettisoned. The Crew were ordered to brace themselves at crash stations. The flaps were up. The Pilot endeavoured to maintain height as long as he could and when the altimeter read zero he decided to ditch. He lowered his speed to 80 mph on the airspeed indicator and approached the water in a westerly direction, which was across the wind. The trimmer was right back to the tail-heavy position. Cloud 7/10, 1/3 moon, water visible. The wind was 10-15 m.p.h. and the water was smooth. The pilot held off and touched the water first with his tail. The touchdown was very heavy and led the Wireless Operator to suppose that they had landed on a convenient beach; he, therefore, jumped out on to the wing. When the aircraft came to rest, the nacelle-stowed dinghy inflated by the action of immersion switch. The dinghy inflated upside down. The Captain was 2nd out of the Aircraft, and as he left, he closed the cockpit hatch, thereby freeing the Astro hatch. He then jumped into the sea to right the dinghy, which he succeeded in doing, but brought it over upon himself. During this drill, he swallowed a lot of seawater which subsequently made him very sick. The rest of the Crew came to the Captain’s assistance and, having boarded the dinghy, they hauled him aboard also. The Aircraft was gradually sinking, and no sooner were they all safely in the dinghy than the Hampden went under. The Aircraft floated for only 2 minutes. Radar Communications Devices in a Lancaster. A fully equipped plane had 40-50 radio “boxes” using more than 300 valves. This diagram indicates how many navigational aids Radio and Radar provide. Edward “Ned” Fennessy joined the Air Ministry Research Establishment at Bawdsey Manor in Suffolk in 1938. The work there was led by Robert (later Sir Robert) Watson-Watt, who had patented the first British “Radio Detection” Technology 3 years earlier. Fennessy played a part in the development of this system – later called RADAR as an acronym for “Radio Detection and Ranging” – and the planning of a Network of early-warning coastal “Chain Home” stations which were to play a crucial role in Bomber Command. A bluff, tough and often outspoken Londoner of Irish parentage, he responded to an invitation to join the RAFVR by insisting that he would do so only in the Rank of Wing Commander. After Commissioning, he was shocked to find he was only a Pilot Officer (Probationary) – but he was soon in charge of offensive Radio Navigation aids in RAF No.60 Group. Based at Oxendon, a Victorian pile near Leighton Buzzard, and staffed by former BBC technicians alongside regular Officers, No.60 Group was known to Fighter Command Airmen as “the Group that Flaps but seldom Flies”, but it gave vital support to British and American pilots throughout the War. In January 1942 – by now a squadron leader – Fennessy took responsibility for the troubled project to establish “Gee” (G for Grid) Ground Stations to provide accurate offensive Air Navigation for Bomber Command and Coastal Command. In late 1943, on his own initiative, he prepared a master plan for Navigation and Pathfinding systems to support a possible Normandy landing; but the Air Ministry reacted with horror when he presented his scheme since he was not privy to the plans for the real landings. He was briefly detained by Provost Marshals for breach of Security until he convinced them that his work was no more than a hypothetical concept. He was then “bigoted” – taken into the top-secret Overlord planning process – and so forbidden to tell even his immediate superiors at Oxenden what had transpired. (1) H2S scanner, housed in a blister below the RAF roundel. (2) Wireless Telegraphy link with Group H.Q. (3) “Gee” system of navigation, based on information from a series of ground stations. 4) As homing bomber approaches coast, radio track guides (using Standard Beam Approach aerial) assist navigator. (5) Medium frequency beacons provide direction-finding facilities, using loop aerial inside plane. (6) Main Beam Approach beacons give steady signal tone if the Pilot is on the correct line of approach to the Aerodrome; too far to Port, he hears series of Morse dots, too far to Starboard series of dashes. (9) and (10) the inner marker beacon on the Aerodrome boundary and outer marker beacons 2 miles away give pilot his distance from the runway in final stages of a beam approach, using dipole aerial. (11) a “Darky” or emergency radio-telephone ink to the ordinary R/T aerial, if all other radio aids fail. (12) VHF communication with other aircraft. (13) Medium frequency Direction Finding stations, which are widely spaced, up to 6700 miles apart. The aircraft uses trailing aerial wound off a drum. (14) IFF-Identification – Friend or Foe – a system with a special aerial. IFF distress version is used by aircraft in difficulties to call the ground stations attention. (15) Fighter Warning equipment, warns bomber Crew against aerial attack. (16) “Mountain Goat” device gives audible warning of nearby mountains; ground installations need to be erected on the mountains. There were no racial overtones to the phrase Darkey. The word referred to the blacked-out English bombers that flew their missions at night and were the principal users of the Darky system. Because of the 100’s of Military Aircraft flying in the limited airspace over England, Command Set radios had signal suppressors installed which normally limited transmission to a distance of approximately 10 miles. Control Tower radio signals were also suppressed to a 10-mile range. The fact that a Command Set transmission was limited to 10 miles led to the development of a navigation aid called Darky. The entire English countryside had a network grid with circles of 10 miles radius. Each contained an observation post which monitored 6440 Kc or Mhz, on the command set radio. A lost Pilot looking for help had to follow a prescribed procedure. 1st, he had to say, “HELLO DARKY” 3 times. 2nd, he identified himself 3 times. If the Pilot followed the prescribed procedure, Darky would then reply giving his location in the clear. Should the Pilot need further assistance, Darky would provide it. For example, a Pilot might request course and distance to say Ridgewell. Darky might then reply, “Ridgewell is 42 miles, course 135º.” All the Pilot had to do was fly 135º. If his true airspeed was 120 miles per hour he would fly for 21 minutes. This procedure should have put him within range of the Ridgewell Tower. Some Darky stations did not have radio transmitters. These were normally searchlight batteries. If they received a Darky request at night, they would raise and lower the powerful beam 3 times. The 3rd time the light came to rest in a horizontal position pointed in the direction the Pilot should fly to reach his destination. Darky really wasn’t too popular among the Pilots and Navigators who hated to admit they ever got lost. But it was mighty handy when the chips were down and there was no alternative. Malted milk tablets, liver toffee, matches, chewing gum, boiled sweets, Halazone tablets (water purification), Benzedrine tablets (Wakey Wakey’s), fishing line, compass, sewing needle and thread, razor and soap. Escape Packs were issued sealed and collected from crews on their return. They came in several different forms, fitting easily into a battledress pocket, and each contained a variety of useful items and ingenious gadgets to help its owner with his escape and survival. They included packets of real foreign currency and detailed waterproof maps of Europe printed on silk, some of which showed the best escape routes and frontiers. These were sometimes issued separately. Occasionally sewn into battledress lining, and at other times as part of a complete escape pack. The Type 2 Ration and escape pack, made from clear acetate plastic in 2 closely fitting sections, was known as an escape box. It contained rations for 48 hours and a variety of aids for survival when living off the land, including high-energy foodstuffs such as Horlicks tablets, chewing gum, chocolate, barley sugar sweets, and a tube of condensed milk. The survival aids included matches, magnetised razor blades (to serve as a compass pointer), a small compass, a heliograph (to signal with), Benzedrine tablets (known to aircrew as ‘wakey-wakey pills‘) to combat tiredness, water-purifying tablets, a rubber water bottle, needle and thread and fishing twine, a razor and soap. The contents varied from kit to kit and on what condensed rations were available at any given time. The Mk IV Escape Box was cleverly designed as a hollow circular container that could also double as a water bottle. Its contents included a silk escape map, Horlicks tablets, chocolate, water-purifying tablets, matches, needle and thread. To empty the contents, the side of the box had first to be removed and then replaced to form a bottle. The stopper unscrewed to reveal a tiny watch and compass. In addition to the Escape packs, there were additional pieces of Escape Equipment and gadgets issued as personal items, or as articles of clothing and flying kit. These included the 1943 pattern flying boots that could be cut down to make a pair of walking shoes, the standard issue British Forces Bakelite razor that often contained a compass in the base, a magnetised fly-button compass, tunic and cap buttons that unscrewed to reveal a tiny compass, a tobacco pouch containing a map concealed inside the lining, and a pencil that is broken at a certain letter embossed on the pencil would reveal a tiny compass inside’.